I absolutely could not wait to get started on The Chaos of Standing Still by Jessica Brody, not only because it has an adorable cover, but also because the story sounded really interesting. I’ve only read one book by Jessica in the past, (though I have a TON of her books on my TBR to read), but I really enjoyed that book, so I was curious to see if I would like this one as well, and I did! Let me start this off by talking about the storyline for the book. Can you imagine being snowed in at an airport, ON New Year’s Eve?? I’m all about being snowed in, but in an airport, with so many other people?! No thank you! (I’d definitely prefer to be in my own house when/if that happens.) That’s basically what happens to Ryn when she flies through Denver on her way home to San Francisco. Along the way she meets some new friends, explores the exciting world that is an airport, and comes to terms with the loss of her best friend, all on New Year’s Eve. Sounds pretty interesting, right? I thought so too, which is why I basically flew through the pages while reading the book. Not only did I enjoy the storyline, but I liked the characters as well. I could totally feel Ryn’s pain for how she felt about her best friend. I totally get why she’d feel the way she did. I love meeting all the new people that she met in the airport, including Xander, who sounds pretty adorable. They had a lot of interesting moments together, not all great, but watching their short relationship grow over time that was interesting. I also appreciate that the author made me feel SO many things while reading this book. One minute you’re happy, the next minute near tears, then BOOM, happy again! 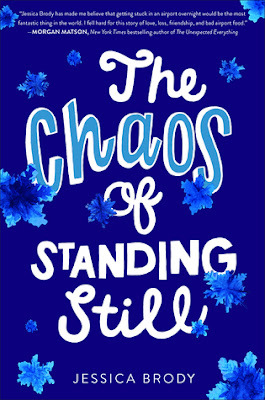 Ovearall; I really enjoyed reading The Chaos of Standing Still! The storyline was interesting, and the characters were fun to get to know. I also enjoyed the little adventure around the airport as well! Definitely add this to your reading list, especially if you’re looking for a book to round out your reading list for the year!